The remote works from up to 40' away. Since it's 'RF' (radio frequency) you don't need to point it or have line of sight to the radio. What's in the Box? 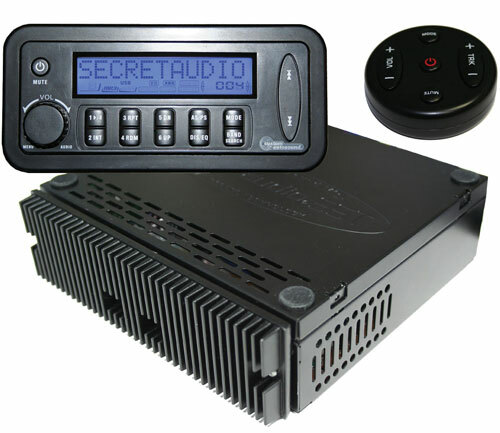 - RF remote - RF receiver - iPod docking cable (7') - cable from LCD to tuner amp (10') - tuner/amp - flush mount bezel - swivel bracket - the USB port is on a 12" lead coming of the back of the tuner/amp. As you can see there are many connections but you don't have to use them all. We've made this system as flexible as possible so you can make your sound system as elaborate as you want.